'Breaking News' Artists Use Mass Media As Their Medium An exhibition in Los Angeles features some 200 works of news-inspired art, dating back to the 1960s. Many of the images are disturbing; "Art is more than a pretty picture," says curator Arpad Kovacs. An exhibition at The Getty Center in Los Angeles features some 200 works of news-inspired art, dating back to the 1960s. Above, The Air Power of the World from Masao Mochizuki's 1976 "Television" series. Breaking news is everywhere, 24 hours a day. And now, it's made its way into an art gallery as well — in an exhibit called "Breaking News: Turning the Lens on Mass Media." In Los Angeles, a Getty Museum show examines artists' reactions to mass media in decades past. The exhibit includes more than 200 photos and videos, from 17 different artists. They're not photojournalists — these artists take the work of photojournalists, and turn it into something else. Balloons is a part of Martha Rosler's "House Beautiful: Bringing the War Home" series. 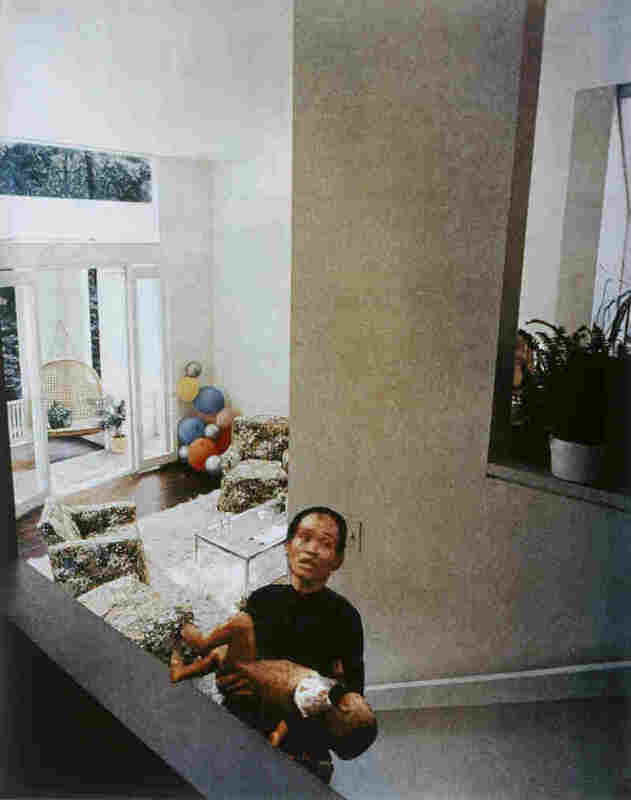 Martha Rosler clipped a Life magazine color photograph of a handsome 1960s living room, and on top of it, pasted a shot of a devastated, Vietnamese man carrying his blood-spattered child. The sobering juxtaposition brings the war into the American living room. "Often these images from Vietnam were appearing in the exact same issues as these interior scenes," explains Arpad Kovacs, who curated the show. A reader could easily flip through the magazine and miss one or the other. But the artist intervenes. "What it does is it makes America confront two different realities. ..." says Kovacs. "It's very political, it's very aggressive. But it's meant to be. You know, a lot of these pictures initially circulated in underground magazines. These are pictures that are not on the fence. They really stake a claim and stand for something." Rosler was a student of John Baldessari — the 85-year-old artist is an iconic figure in the Los Angeles art world, with works in major American museums. He, too, manipulates photographs, adding text, and lettering. He once had students in his Conceptual Art class react to undated, uncaptioned news photos he pinned to a bulletin board. In one news picture, a uniformed man kneels, bending his face to the ground. He could be kissing the ground, or smelling the grass. "You don't know," Baldessari says. Which is exactly the artist's point — he wanted his students to ponder what was going on in the photo. Meaning is slippery, Baldessari says. Donald R. Blumberg's Untitled work from his series "Daily Photographs, 1969-1970." There's clear meaning, though, in the newspaper photographs Donald Blumberg uses in his art. During the Vietnam years, he had a photo show at the State University of New York at Buffalo. Police occupied the campus during an anti-war student protest. A flying wedge of cops ran by, chasing the students. "They were trapped in the stairwell of the campus and beaten with clubs," Blumberg says. And for him, that was the last straw "in thinking I was going to be a decorative, fine art photographer, doing beautiful photographs for people to look at." He started clipping news photographs that captured the disaster in Vietnam. 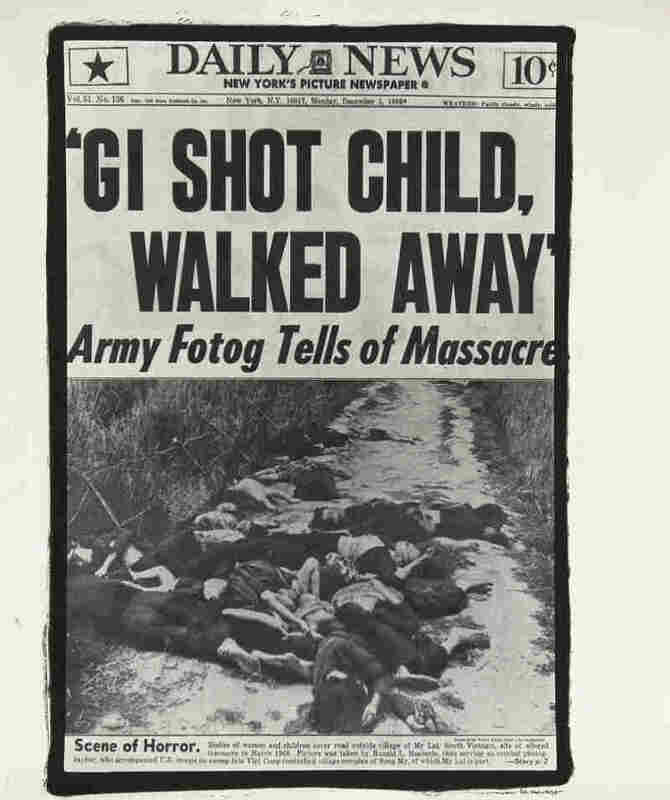 He enlarged, and then photographed page one of the New York Daily News — a photo of the massacre in the town of My Lai, with the headline, "GI Shot Child, Walked Away." Another headline reads "Grenade Is Cut From Prisoner's Face," with the X-ray of that face, and the lieutenant who dug out the live grenade with his pocket knife. Around each story, Blumberg shows a thick dark black frame — the black is in memoriam, like the black ribbon worn after a death in the family. "I like to be as political as I can," Blumberg says. "One of the ways of being political is through my photography." 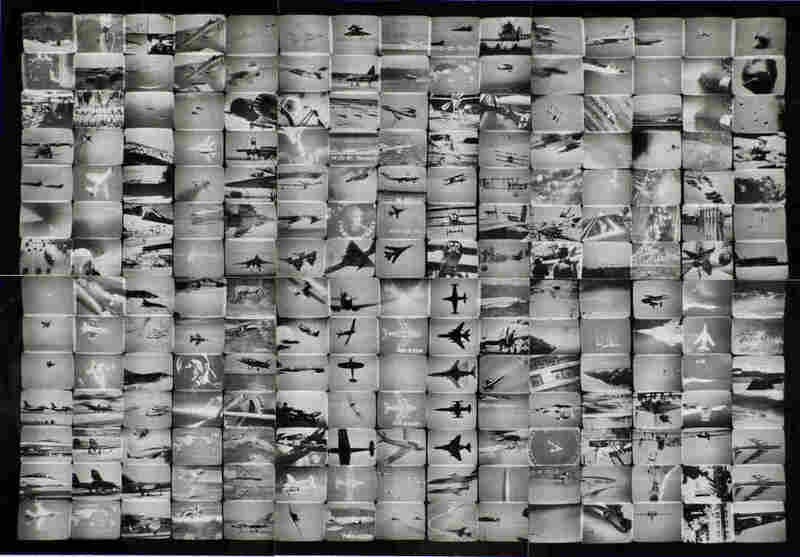 Every day we are bombarded by photographs — more images than we can possibly absorb. For Donald Blumberg and other photographers in this exhibition the magic of still photography is that it stops time. It gives viewers the chance to really look and think about what's happening in our world. "I think good art is always about something difficult. Art is more than a pretty picture," Kovacs says. "Good art is about sort of challenging the status quo and making a statement." Through their photographs, these artists are bearing witness for future generations — those who weren't there when the news actually broke.